Rap artist Kenrick Lamar provided the entertainment during the half-time break of the FBS national championship game this past January and the next day it prompted a discussion around the office cooler where I work about whether Lamar really is a Christian. Some defended the assertion, but is he really in the sense that Christ would recognize him as one? First, in his own words then using the means by which he makes a living let’s see if he is. Then, lets take a look at what God’s holy word says. “I went to a local church some time ago, and it appalled me that the same program was in practice. A program that I seen as a kid the few times I was in service. Praise, dance. Worship. (Which is beautiful.) Pastor spewing the idea of someone’s season is approaching. The idea of hope. So on and so forth. As a child, I always felt this Sermon had an emptiness about it. Kinda one sided, in what I felt in my heart. Fast forward. After being heavily in my studies these past few years, I’ve finally figured out why I left those services feeling spiritually unsatisfied as a child. I discovered more truth. But simple truth. Our God is a loving God. Yes. He’s a merciful God. Yes. But he’s even more so a God of DISCIPLE. OBEDIENCE. A JEALOUS God. And for every conscious choice of sin, will be corrected through his discipline. Whether physical or mental. Direct or indirect. Through your sufferings, or someone that’s close to [sic] ken. It will be corrected. Ooh, that p###y good, won’t you sit it on my taste bloods? Is it obvious to you like me that if Kendrick Lamar is a Christian he’s been influenced by the Mark Driscoll style of faith, you know the potty mouthed type? Keep in mind the tunes he sang during the televised half-time period were most definitely deemed acceptable by ESPN, the NCAA and the corporate sponsors for its viewing audience. Past half-time controversies were surely in their memories. If those tunes reflect Lamar’s true faith world view then it certainly matches the kind of tactics taken by too many churches- accommodate the sinful manners and habits of the un-churched so they’ll show up on Sundays! Do it by not telling them they’re unrepentant sinners headed for Hell! ‘Course, Kendrick doesn’t just load up with the foul language and all the rest with just these three tunes. You should see the words to God; Fear; and Lust, also on his DAMN album. The problem with it all is it goes against Christ’s teachings. Christ followers are to be salt and light to the dark and fallen world and those in it. Potassium Chloride, or what we call salt has been known as a preservative for thousands of years. It keeps meat from rotting. The Egyptians used it to preserve the bodies of their dead. It was such a valued commodity some history scholars believe more wars were fought for it than for gold. It was valued in the 1st Century Israel also so no wonder it was a metaphor used by Christ and the Gospel writers to describe the saving grace of the Gospel message and how it preserves the souls of those who accept it from the eternal rot of Hell. So on the evening of January 8th, 2018, we had the all accommodating message the Scriptures (Matthew 24:24; 1 John 4:1; 2 Peter 2:1; 2 Corinthians 11:4; and Galatians 1:6-9) tell us to avoid targeted to the millions that make up the Hip Hop generation. Nowhere (at least during the televised portion of his gig) did Lamar encourage his audience to come to Christ; to repent or seek prayerful worship. I have no doubt the millions watching believe in Christ. They claim he is their personal savior but far, far fewer have ever really been regenerated and strived or have striven to give up their favorite sins, to seek holiness. Alas, they’re no nearer to salvation than the lowest demons in Hell. Even they believe in Christ. The bible tells us so. If Lamar’s kind of faith message was medicine it’s watered down gospel message would help no one. In fact it would work more like poison, sending people who use it to Hell for never being truly regenerated, thinking all they have to do is have an intellectual knowledge of Christ but continue to live the same old sinful way or as in Lamar’s case the same old way to make a living. For example if you’re a thief and you continue to steal after accepting Christ as your savior then you’re living outside the bounds of obedience to his teachings and you’re vulnerable to final judgment if you don’t stop it and repent! That would include espousing the practice of stealing also, or any of any sin for that matter! “But he was just singing! It wasn’t supposed to be a church service for Pete’s sake!” someone defending him will cry out. That kind of “entertainment” (if one insists on calling it that) isn’t driven by the Holy Spirit because anyone truly under the spirits influence would see their sinful ways and work to (figuratively speaking) wash themselves clean from it. They would seek holiness. They would even refuse to participate in anything that might send someone else astray. 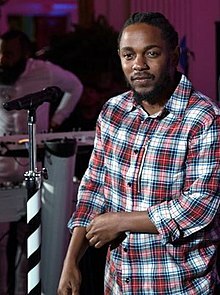 See, any truly regenerated Christian like Kendrick Lamar thinks he is would rather dig a ditch to make a living than churn out music that promotes, entertains or feeds the minds of his audience with thoughts of violence, racial tension, lust, the degradation of women, humanist pride all punctuated with four letter language! Instead he would perform music that indicates he is seeking holiness, what’s called sanctification. Check out 1 Peter 1:15; John 15:8; 1 Timothy 4:4-5 and 6:11. Finally, Christ tells us many who proclaim his name but never really knew him will wind up in Hell, and the road there is wide for a reason because billions will be duped into going there. He also tells us the path to Heaven is narrow.